MoviePass' stock price has fallen off a cliff. The company couldn't afford to pay for movie tickets last week. And management keeps changing the service's terms and price. But everything is cool, and MoviePass isn't going anywhere -- according to MoviePass. "To paraphrase Mark Twain: Talk of our demise is greatly exaggerated," MoviePass said in a press release Thursday. 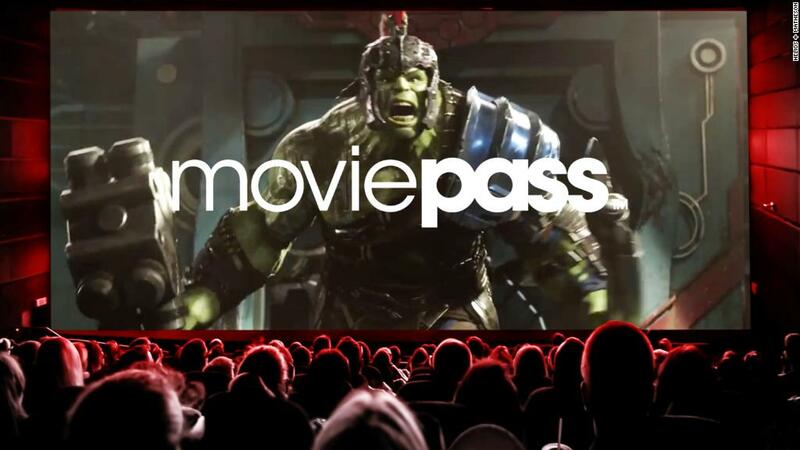 MoviePass, the subscription service that turned heads when it began charging $10 a month to see a movie every day, said it is industry pioneer that is responsible for as much as 6% of the movie industry's total box office receipts. It counts more than 3 million people as subscribers. "Exhibitors know that without MoviePass they will be able to continue to charge exorbitant prices for theater tickets and gouge customers with overpriced concessions," the company said in its release. "This is exactly the attitude the taxicab industry took when Uber entered their market." Moviepass admitted, however, that it is "going through a rough patch not unlike what other disruptive enterprises experienced in their early days." That's an understatement. Parent company Helios and Matheson's (HMNY) stock has cratered from a record high of $39 last October to as low as 12 cents Thursday. It's even worse than it seems. The company approved a reverse stock split last week that boosted its stock price 250-fold from 8 cents to $21. The stock has nearly fallen all the way back, losing 99% of its value since then. Also last week, the company borrowed $5 million in cash to pay its merchant and fulfillment processors after it had a service outage and couldn't afford to pay for movie tickets. The company said Wednesday that it paid back that loan. It's not clear that it will survive much longer. MoviePass is right about one thing: Its influence on the movie theater business has been extraordinary. Theater tickets are costly, and the subscription model has shown that people are willing to go to the movies for a much lower overall price. "If it does close, it burned brightly, and it did change things for the better for audiences," Jeff Bock, a box office analyst at Exhibitor Relations, told CNNMoney earlier this week. "The subscription service is something Millennials are very accustomed to, and the next generation will be as well, so it definitely needed to happen." Just look at what's happened in the industry since MoviePass took the box office by storm last fall. Cinemark launched a monthly plan last December, and AMC Theaters came out with its own service in June. Bock said that there may still be an opportunity for a MoviePass-like service in the space. Both AMC (AMC) and Cinemark (CNK) are offering loyalty programs that don't include the flexibility of seeing a movie in any theater, which is something that MoviePass has been able to tout. But he doubts MoviePass will be the company that rises to the occasion. In particular, Bock criticized the lack of transparency from the company, adding that its customers are often the last to know about major changes to the product. The service that once advertised "unlimited" access to see movies in theaters said earlier this week that it is raising the monthly price to $15 while also cutting access to blockbusters within the first two weeks of their release. MoviePass "is still doing everything backwards," Bock said Thursday. "If they survive, or another company swoops in and picks up the pieces, it will be a valuable learning tool on how 'not' to do business."